Learn a classic Jimi Hendrix style guitar lick similar to what Hendrix plays at the end of his classic ‘All Along the Watchtower’ solo. This lick uses many classic Jimi Hendrix style moves and is a cool addition to your guitar lick bag. So let’s jump in and check out the this Jimi Hendrix lick! 0:15 Here’s the Jimi Hendrix lick you’ll learn in this guitar lesson. 0:29 The lick comes from the C# blues scale played up around the 9th fret. Here’s the scale pattern Jimi Hendrix is using for this particular lick. 0:55 Jimi Hendrix Lick chunk 1. 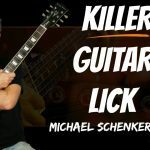 Here’s how to play the first part of the lick. 1:30 Jimi Hendrix lick chunk 2. Here’s how to play the second part of this guitar lick. Notice all the cool bends…take ’em and make sure you’re using these in your own playing. 2:09 Jimi Hendrix lick chunk 3. Here’s how to play the next part of this guitar lick. Notice the cool blues scale runs here. Take these and experiment with making up your own guitar licks using these as a starting point! 2:33 Here’s the complete lick played slowly. 2:43 Here it is played over the backing track. Experiment with this lick to see how you can make it work in your playing and remember the most important thing is to create variations of your own.